Kathy Jetnil-Kijiner, solastalgia: Marshall Islander's poem moves U.N. climate summit to tears. 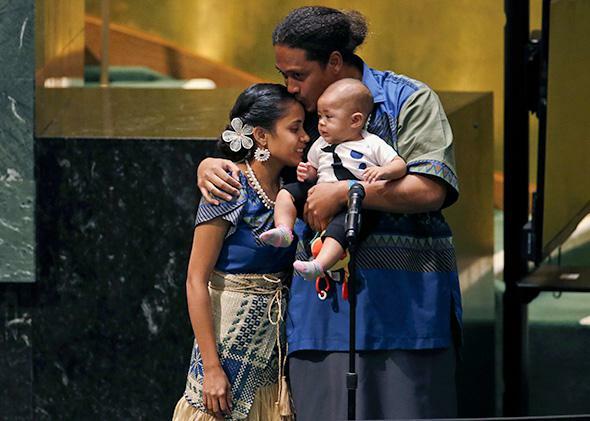 Kathy Jetnil-Kijiner (L), Civil Society Representative from the Marshall Islands, is greeted on stage by her husband and her baby after speaking during the Climate Summit at United Nations Headquarters in New York, September 23, 2014. It’s been buried under news of Syria, but today saw the single most important meeting on climate change in five years, a gathering of most world leaders at the United Nations in New York. Predictably, almost nothing was accomplished. President Obama at the UN: "Please accept this nothingburger in place of a respectable climate plan"
Notably absent was any new U.S. pledge of support for a fund designed to help poor countries adapt to climate change. Instead, Barack Obama pledged to announce new carbon-cutting targets for the United States “next year.” Mashable has a continuously updating map of climate-related pledges made on Tuesday. One of the day’s biggest wins was a pledge of $6 million by China. The media let out a collective yawn. CNN now literally showing Wolf Blitzer sitting on the sidewalk with some guy in lieu of Obama's climate speech. But there should have been outrage. Obama’s “commitment” comes a day after new data showed that U.S. emissions grew in 2013 for the first time in five years (thanks to a resurgent coal industry), helping push global emissions to a new record high. Survey results released Tuesday from the Chicago Council on Global Affairs showed an uptick in concern over climate change since 2012, but it still ranks the issue relatively low on Americans’ worry list, perhaps due in part to the continued misperception of climate change as a far-off threat. Not only is the United States not doing our part, we’re still actively making things worse, no matter the rhetoric from the White House. During Obama’s presidency, fossil fuel subsidies have actually grown. The poem was written and performed by Kathy Jetnil-Kijiner, a 26-year-old native of the Marshall Islands. After her recitation in front of 120 heads of state, her daughter and husband joined her on stage, to a standing ovation. An official U.N. Twitter account said many world leaders were moved to tears, evoking memories of a stirring speech from the Philippines representative Yeb Saño during the last major U.N. meeting on climate change, held just days after Typhoon Haiyan. To say the Marshall Islands is among the countries most affected by climate change is a huge understatement. Jetnil-Kijiner’s moving letter to her child is an example of solastalgia, the increasingly pervasive feeling of sadness and loss for a world that’s being irreversibly altered. The Marshall Islands are at the forefront of global warming, but the struggle of those most affected impacts us all. Days like today are soul-crushing for those of us who follow climate news closely. But even though this problem often feels hopeless, stories like Jetnil-Kijiner’s and events like Sunday’s march show there are hundreds of thousands of people out there who are working for change against what seems like a tidal wave of apathy.